I have a few questions about WCFB carbs. I know nothing about them. 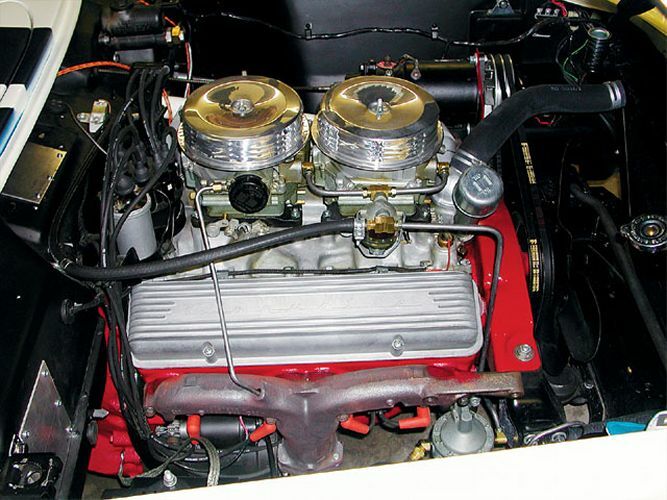 If I am going to run two on an Edelbrock 257 Y Block manifold, do I need a specific model carb? I see some Mercs had them. Can I use two from a GM car? Do they need to match? 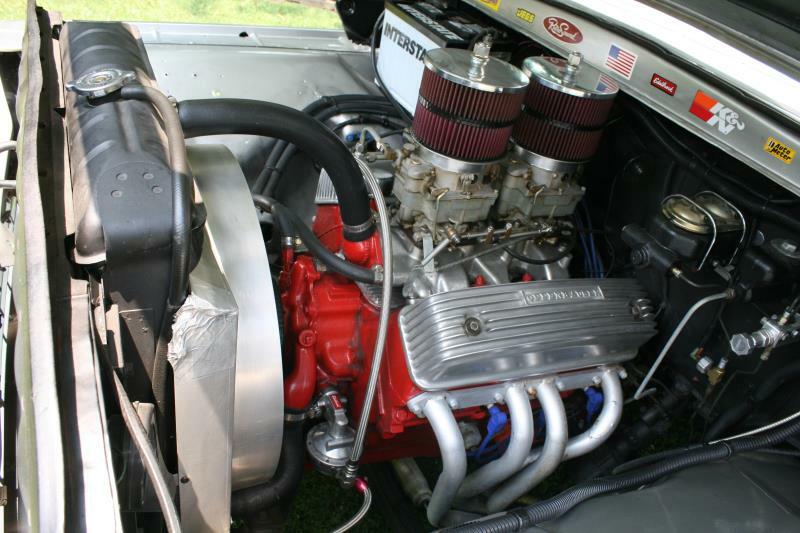 When I ran a single WCFB I used a 53 Cadillac from a 331" on an "A" manifold. The fuel line came in at the rear and was ez to set up. I had to bend up a small arm on the carb linkage and make another bracket which I attached to the factory foot feed linkage. I used this carb on the rear when I went to dual quads along with a 53 Oldsmobile from a 303" on the front. It's fuel feed was on the front. I did the exact same thing on the carb linkage as I found them almost exactly the same. I had to make a new arm from the Ford stock linkage that was shorter so I could keep the original if I ever went back, I ran that set-up for about a year. When I found another 53 Olds WCFB with a matching brass tagI moved the front to the rear and put the new one on the front. I only needed to make a new fuel line as I had already made the carb linkage. I wanted to have mine progressive and bought a set of repopped Ford 427" dual quad linkage from a supplier. I was able to use the slider and reposition the front carb linkage lower so it would open a little later. I made part of it myself by threading a steel tube and flatning one end and drilling a hole in it. It's not perfect but works well. In my opinion there's not much out there and you need to fabricate a lot of what you need. A scrub foot feed would have been a lot easier to work with if I had a standard trans. All my shifter for the auto and kick down still work even with the current conversion to a Cruise-O-Matic. GM had the most user friendly setup on the early VETTES. Study those setups for information. Since the Ford fuel pump is on the opposite side of the GM setup I wanted to keep it all on the left. 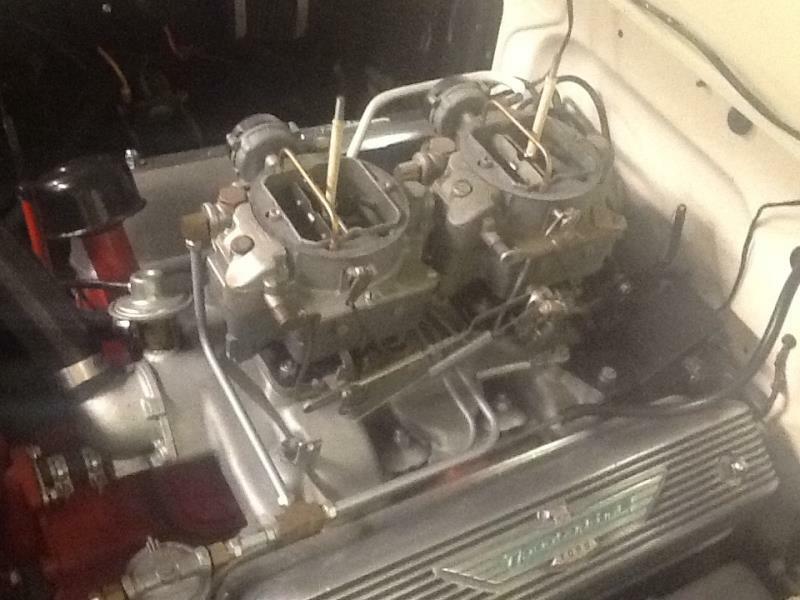 I’m partial to the GM WCFB carbs on the Y dual quad setups if not using the Holley 2140 or 4000 4V carbs (Teapots). The Mercury WCFB’s are not as friendly when working with them in pairs. The secondary diaphragm chambers on the Merc carbs tend to get in the way of the distributor if not using carb spacers to raise the carbs and are also harder to tailor the secondary springs accordingly. The Merc carbs were also designed to use with the LOM distributors which make the distributor vacuum port on those carburetors not suitable with the later model distributors. There were a multitude of those WCFB carbs installed on the GM vehicles so I’d recommend finding a pair that’s very similar to each other if using them in a dual quad application. Using a pair from the same make of car would be ideal (Olds vs Olds, Cad vs Cad, etc.) . Getting the exact same carbs would be even more desirable. The Merc carbs were also designed to use with the LOM distributors which make the distributor vacuum port on those carburetors not suitable with the later model distributors. The 57 MERC 368 and LINC 368 used non-LOM WCFB's also. Thanks for the input. I would prefer to use WCFB carbs as they fit the 257 manifold without adapters and they are more period correct in my view. There are a few things that are troubling to me. First, they are somewhat costly. Second, they are 60 years old. Two modern 500 cfm Edelbrocks can be bought for $800 plus adapters. Is it possible to buy two matched decent running WCFBs for $1,000? If not, how much can I expect to tie up in them? I have also heard they are difficult to tune. I need to learn more about WCFBs. Absolutely right. Those '57 WCFB's do not come up very often. I have been having trouble with a set of WCFB's with vacuum operated secondary's. See 292 Y block stalling issue (Joe D) 19 pages! I had them rebuilt but not calibrated because I could not ID them 100%. Before and After rebuild could not get truck to idle below 950RPM. Just installed a single carb manifold and I'm going to test drive soon. I did not give up on the Carters yet. I may send them back and have them take a shot at recalibrating. Seems like the throttle plates are not closing all the way. I also may try one Carter at a time now that I have a single carb manifold. I will let you know if I'm going to sell them and the Edlebrock manifold. I have read references whereas CARTER had trouble with the vacuum secondary models. The GM (VETTE) setup uses mechanical secondary's. JoeD- I have the instruction(s) sheets on ADJ the secondary's if you want it. If the re-builder couldn't set to specs the first go-around, I don't think I would trust him a second time.